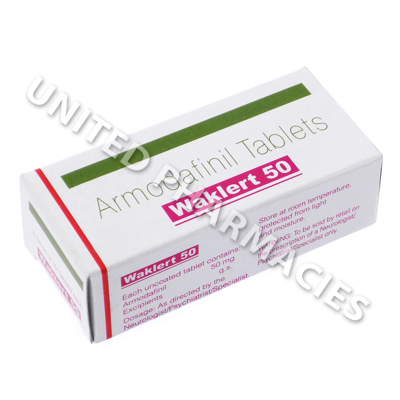 Waklert (Armodafinil) is used to manage narcolepsy, shift work sleep disorder, and obtrusive sleep apnea (hypopnea). In addition to these main uses it is also very popular as a nootropic and study aid due to its memory and concentration enhancing properties and it's ability to ward off tiredness during cramming sessions or exams. Other off-label uses include the treatment of chronic fatigue syndrome, ADHD (attention deficit hyperactivity, depression, Parkinson's disease, fibromyalgia, cerebral palsy, and multiple sclerosis. It is even believed to promote weight loss. Normal dosage of Waklert (Armodafinil) is one tablet once per day. If you suffer from narcolepsy it is recommended you dose early in the morning. If you suffer from shift work sleep disorder it is recommended dose at least 1 hour before starting your shift. If your shifts are not the same time each day, consult your doctor for the best way to dose. Side effects experienced are usually mild and do not require medical attention. 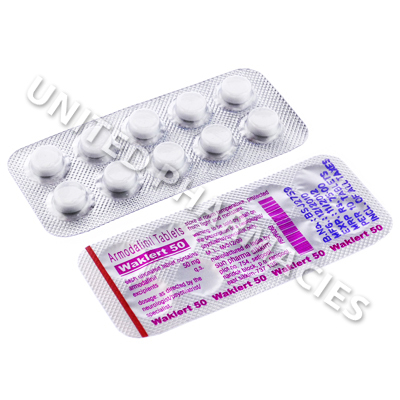 Common side effects experienced by patients taking Waklert (Armodafinil) include dizziness, insomnia, loss of concentration, tremors, nausea, vomiting, diarrhea, upset stomach, appetite loss, changes to urination. If any of these persist or become worrying it is important you promptly inform your doctor. Serious adverse effects which require immediate medical attention can occur. These include skin rashes, hives, blisters, mouth sores, swelling of the eyes and/or limbs, hallucination, anxiety, difficulty breathing. Patients taking Waklert (Armodafinil) are at risk of developing a physical dependency on the drug, so should never self-medicate or alter their prescription strength or length without being instructed to do so by their doctor. Inform your doctor if you have a history of alcoholism or any other drug dependency. Waklert (Armodafinil) may reduce the effectiveness of female hormone based contraceptives like the pill, patches, and injections. It is strongly recommended that female patients taking Waklert do not rely on these forms of contraception and that a second, barrier-type contraception is used, such as a condom. Waklert (Armodafinil) may be habit forming, so it is essential you stick to your prescribed does and never self-medicate or adjust your dose unless advised to do so by your doctor. Always use Waklert (Armodafinil) as you have been prescribed by your doctor. Never self-medicate or change your dosage without first consulting your doctor. The correct dosage can vary depending on your health, medical history, and the severity of the condition being treated.